You will save the day when you fill your little reader’s book basket with these firefighter books. They’ll discover what life in the fire station is like, what firefighters do, and more. They’ll even discover some of their favorite characters in these books! 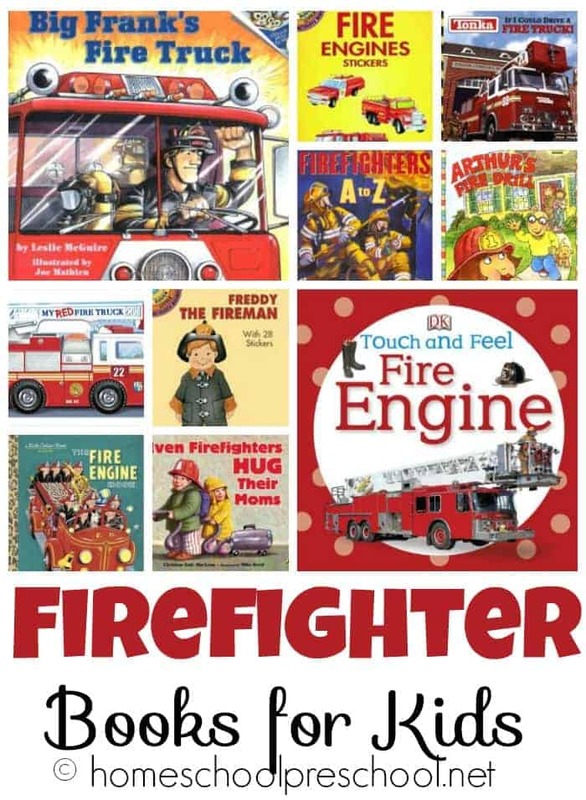 These books make the perfect addition to my fire fighter printables! Fire Engines Stickers – This exciting sticker collection invites you to take an imaginary ride on a fire truck—sixteen different ones, in fact. The awesome caravan of colorful fire department vehicles includes a floodlight truck, sky-life engine, ladder truck, tanker, pumper, aerial ladder, ambulance, and more. Freddy the Fireman – Freddy wants to be a firefighter when he grows up, just like his dad. So, with his Dalmatian puppy at his side, Freddy likes to wear his junior fireman’s gear and pretend that he’s already on the job. Have fun changing Freddy’s uniforms and safety equipment, and perhaps one day, you’ll be a firefighter too. Arthur’s Fire Drill – When D.W.’s teacher announces that they will have a fire drill, D.W. is afraid the school is going to burn down! So Arthur gives her his fire fighter’s hat, a whistle, and a few tips on fire safety, and appoints her their home fire warden. She then sets off to school prepared to take charge. Touch and Feel: Fire Engine – With a sparkling new look, these bestselling DK classics are sure to become classics for a whole new generation of young readers. Babies and toddlers will be drawn to the captivating, tactile pages, and will want to touch, feel, and explore every one. My Red Fire Truck – When there’s an emergency, chances are you’ll see fire trucks and other rescue vehicles racing to the scene with sirens blaring and lights flashing. In this colorful book kids will see fast-rolling fire trucks and fearless firefighters in action as they put out fires and make daring rescues. If I Could Drive a Fire Truck – Gemma loves to play with her favorite toy fire truck while riding in the car to visit Grandma. But when she wonders, “What if I could drive a fire truck?” her imagination takes off, and exciting things happen! Flashing Fire Engines – Jump aboard a bright red fire engine with a trio of friendly animal firefighters as sirens wail, lights flash, fire hoses squirt, and fires blaze — in this story that blends action and rhyme with all the details kids want to know about one of their favorite machines. Firefighters A to Z – Every day, brave firefighters come to our rescue. When the fire alarm sounds, men and women put on their uniforms, slide down the firehouse pole, jump in their big red trucks, and rush to save our lives. From the minute the fire alarm rings, the day of a firefighter is filled with adventure — and danger. Wherever there is a fire, we can be sure that firefighters will always be there! Even Firefighters Hug Their Moms – Who has time for hugs when they’re busy fighting fires, driving an ambulance, and rocketing off to Mars? This little boy and his sister pretend to be all kinds of heroes, but they won’t take a break to give Mom a hug. She reminds them that even firefighters hug their moms, but it’s beginning to look like she will never get a cuddle! The Fire Engine Book – This classic book, reissued for new readers, features large-scale, active pictures that transport readers along with the fire engine to the scene of a fire, where they will witness firefighters connect their hoses and save the day. A Day at the Fire Station – Sound the alarm for a day of fire-station fun! From fast fire trucks and out-of-control hoses to sliding down fire poles and saving the day, children will love this exciting and hysterical story from the one and only Richard Scarry. I Want to Be a Firefighter – The I Want to Be… series gives young children a realistic insight into the working day of adults. Easy-to-read captions and color photographs of women and men from different cultures help children understand what’s involved in each occupation. A Day in the Life of a Firefighter – The fire alarm goes off! Rob Green and the other firefighters go into action. Is there time to save a little girl’s dog? Curious George and the Firefighters – Firefighters are a famously brave lot, but can they withstand a visit from one curious monkey? Big Frank’s Fire Truck – Ride along with Big Frank and the rest of the crew as they race to the scene of an accident, inspect the local KwikShop, demonstrate fire safety at Niceview Elementary School, and battle a raging brush fire! In between calls, hang out at the firehouse with Big Frank and the gang. It’s all in a day’s–and night’s–work for our firefighting friends. Now, let’s get on to this week’s What to Read Wednesday link-up! Last week’s most clicked post was a tie between A Rooster and a Prom Dress and Finding Contentment in the Midst of Change.